Cork and Ross Clergy Mark the Occasion of the Appointment of Bishop Tom Deenihan. September 28, 2018 cork DIOCESAN NEWS, Uncategorized Comments Off on Cork and Ross Clergy Mark the Occasion of the Appointment of Bishop Tom Deenihan. Cork and Ross clergy gathered this week to honour their priest colleague, Bishop Tom Deenihan, on his appointment as Bishop of Meath. Bishop Deenihan was presented, with a pectoral cross by his priest colleagues, to mark the occasion of his appointment and to acknowledge his service in the diocese particularly in support of all the clergy in his capacity as Diocesan Secretary since 2006 and as a highly esteemed colleague. Pictured from left are, Msgr. Kevin O’Callaghan, VG, Msgr. 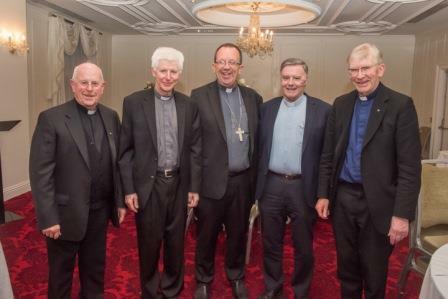 Aidan O’Driscoll, PP VG, Bishop Tom Deenihan, Dean Noel O’Sullivan, and Bishop John Buckley, Cork and Ross.